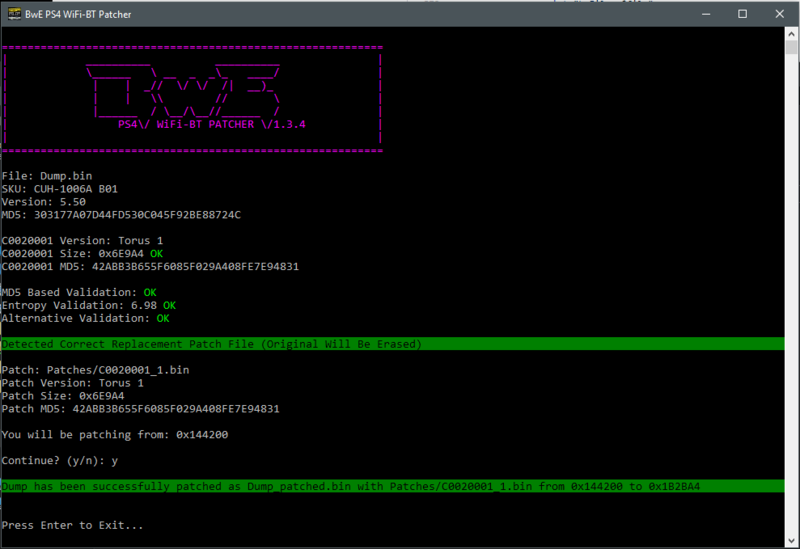 Since his previous work on the BwE NOR / NAND Patcher and BwE NOR Validator updates for PS3, developer @BwE of BetterWayElectronics.com.au has made available a BwE PS4 WiFi / BT Patcher & Extractor v1.00 followed by a v1.3.3 / v1.3.4 and v1.3.5 update for PlayStation 4 developers. He also states on their Downloads page and Profile that he's currently working on a BwE PS4 NOR Validator as well for those interested. Hello! This program, a micro version of my PS4 NOR Validator, is designed solely to validate and repair the WiFi/BT module of your PS4. I have included a small sample of VALID patches for you to use, but you may have to source more yourself. Just place them in the /Patches/ directory with any file name. Doing this will wipe c0020001.bin and its header from your PS4's NOR entirely and replace it with whatever you have chosen. I recommend you stick with the correct Torus version, which will be displayed on screen. Slim & Pro models are generally Torus 2. If you have found a patch that is not on my list, let me know at [email protected] and send me a link to it. Feel free to use my EXTRACTOR to verify its validity and ensure proper extracting! NOTE: My program is designed for Windows 64 - If this is a problem, please upgrade (if you can call it that...) Released 4/9/18 as Version 1.0. The firmware for the WiFi/BT Module is found within the Flash-Main of the PS4 in a file designated C0020001. Its location is 0x144200 and its length can be determined from reading the header information at the start of 0x144000. This is periodically updated during the firmware updates of the PS4 itself. This is the reasoning behind storing the firmware for the module within the firmware of the PS4 itself. This software is known to get corrupt and once it is will render the WiFi and Bluetooth useless. This means that controller cannot function in the XMB. However, the controller can still be used in safe mode as this is the only area of the PS4 that does not utilize the WiFi/BT Module, rather it only connects to the controller via USB. This problem is repairable, given you have a copy of the same firmware for your module. User:BwE has developed a program to aid in the validation, repair and extraction of the C0020001.bin for this sole reason. gluesniffinpete, BwE, alitriple and 8 others like this. More patches and better validation! I also removed the loader! Yes, it says its corrupt and has been patched but when I flashback the bin file. I still cannot sync the controller. So the solution is to change the wifi chip then? Yeah at this stage its 100% a hardware fault. Could even be the antenna (rare). Try a fake controller that only works via USB.